Uplighting is the most affordable way to decorate your reception venue and create ambiance unique to your event. It is a lighting design technique that enhances the atmosphere of an event facility. By placing lighting fixtures on the ground and focusing them upward, uplighting can add color and depth to an otherwise boring wall or column. It also adds energy and vibrancy to your photos! 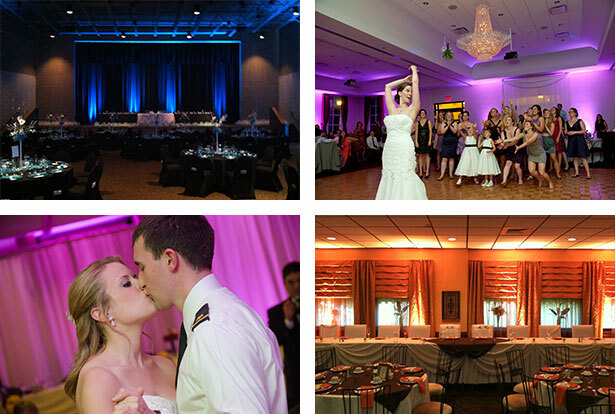 Our LED Uplighting can create practically any color to match your theme. Memory Makers' extensive inventory of powerful, colorful, wireless lights can transform any venue. One of the biggest advantages of using uplights is that it will be in every picture your photographer takes as well. 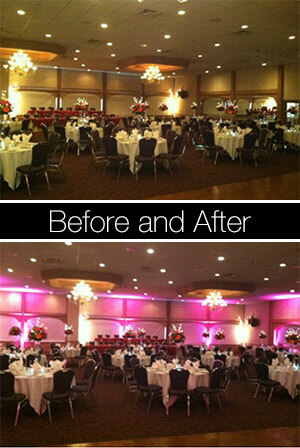 The lights have a huge impact on the setting of your venue at a very affordable price. The lighting package includes setup and tear down. Our lights are wireless for a neat and clean appearance. Before buying expensive extra flowers, favors, or other types of decorations, add the affordable elegance of uplighting to your wedding. Uplights not only work well during the entire event, they also make your flowers and decorations shine throughout the evening.